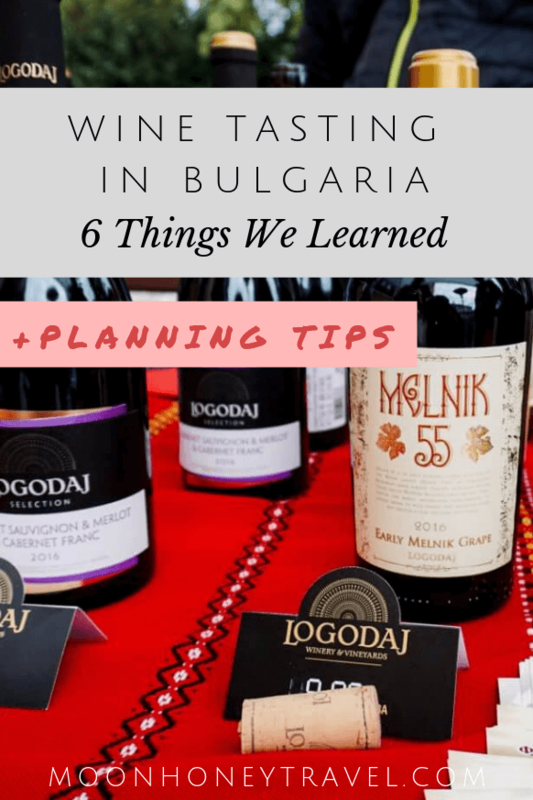 We visited Bulgaria with the sole intention of going wine tasting. Prior to arriving in Bulgaria, we were in Istanbul for two months. Istanbul has many attributes, but wine isn’t one of them. 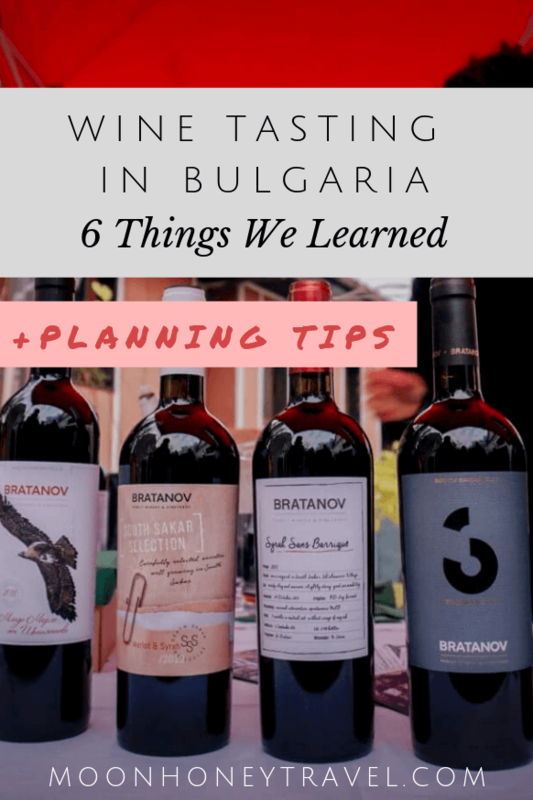 So, when planning our trip to Bulgaria, our focus was wine – and a lot of it. Over the course of 10 days, we had the pleasure of attending the Young Wine Festival in Plovdiv, wine tasting with Bulgaria Wine Tours, and wining and dining in Sofia. We left this Balkan country with bottles in our backpacks and a newfound love for Bulgarian varietals. Bulgaria’s winemaking history and traditions are fascinating. 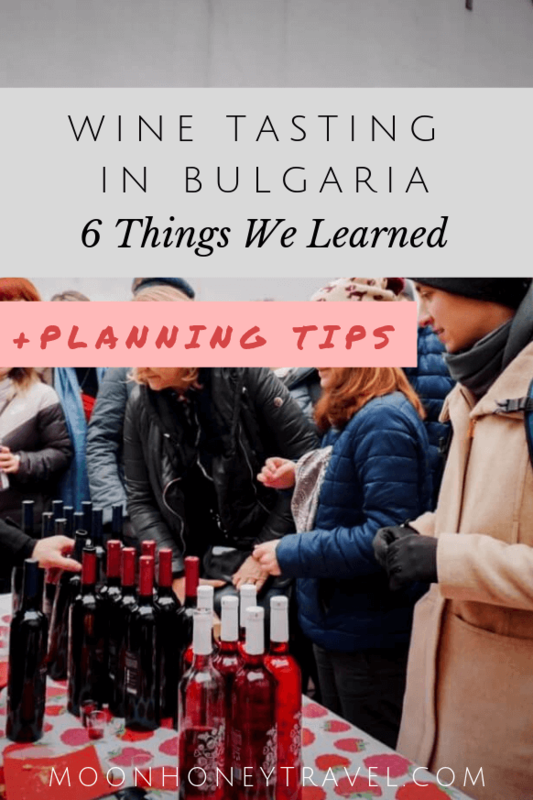 In this post, we’re going to share with you what we learned during our tour with Bulgaria Wine Tours and how you can best plan a wine-themed day, weekend, or vacation in Bulgaria. Planning a trip to Bulgaria? Don’t miss out on What to do in Sofia in One Day and Best Things to Do in Plovdiv – Wine Edition. And while you’re there, connect with us on Pinterest! Bulgaria is one of the oldest wine producers in the world. In fact, archaeological evidence indicates that people started making wine in Bulgaria as early as 5000 BC. These people were the ancient Thracians, a collection of Indo-European tribes, who inhabited the lands of modern-day Bulgaria. The Thracians worshipped wine as a divine drink and Zagreus (aka Dionysus), the God of Wine. They were notorious for their skills at war and winemaking. In Homer’s The Illiad, Thracian wine is mentioned several times as the best wine in the world. A few badass Thracian figures you’ve definitely heard about are Orpheus, the legendary musician, and Spartacus, the gladiator who led the largest slave rebellion against the Roman Republic in the 1st Century AD (source: The Thracians). In Bulgaria, February 14th isn’t Valentine’s Day, it’s St. Trifon’s Day. St. Trifon Zarezan is the patron saint of winegrowers and winemakers. Each year on February 14th, Bulgarians pay homage to St. Trifon by partaking in wine festivities in villages, wineries, and vineyards across the country. Traditionally, a St. Trifon’s Day celebration involves specific culinary rituals, a procession to the vineyards, vine pruning and pouring wine on the soil for fertility. After the pruning, each wine village appoints a “Wine King,” who then blesses the vineyards. After the ceremony, the festivities continue to either the Wine King’s home or the winery. There are 44 indigenous grape varieties in Bulgaria. As much as we love an excellent Sauvignon Blanc, it’s refreshing to taste entirely new varietals with no preconceptions. 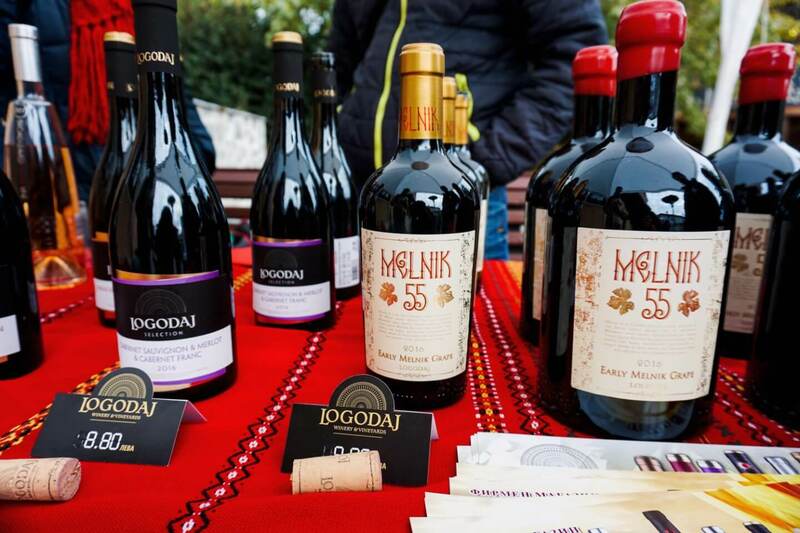 Wine tasting in Bulgaria affords you the unique opportunity to try Mavrud (red), Rubin (red), Broadleaf Melnik (red), Red Misket (white), Dimyat (white) and Tamianka (white). Back in the day when Bulgaria was a communist state, wine production was operated exclusively by the state. In the 1970s, Bulgaria became the 4th largest wine producer in the world. Well-known international varieties like Merlot and Chardonnay were mass planted during this era. Most of the wine was exported to the Soviet Union. So, you probably never tasted Bulgarian wine unless you grew up in Russia. When the communist regime fell (1989), the wine industry collapsed. Land reforms returned the land to the people and wine-production returned to the private sector. However, given the turbulence of the times, there was a stagnation in wine production in the 90s. It’s taken years to rebuild the wine industry and Bulgaria’s wine reputation. The good news is that today many independent winemakers are reintroducing local varieties and championing Bulgaria’s native grapes. The Bulgarian wine scene is shifting. Small family-owned and boutique wineries are emerging and challenging large-scale industrial producers. 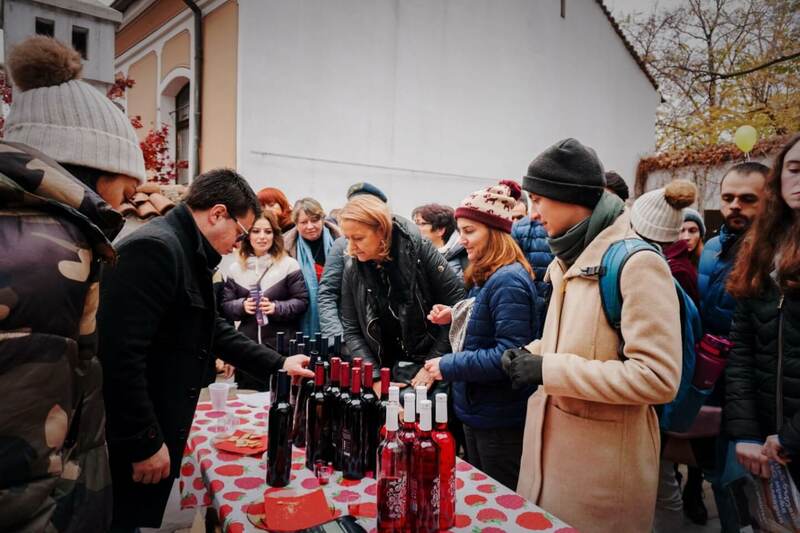 When we attended the Young Wine Festival in Plovdiv, we saw several stands featuring raspberry wine and raspberry wine blends. Our favorite was the Trastena raspberry (50%) – Merlot (50%) blend. Trastena uses 100% organic raspberries and doesn’t add any additional flavors, color agent, fruit juice, or fruit extracts to the wine. It’s a pure product. The raspberries are vinified in the same way as grapes and it takes 1.5 kilos of raspberries to make just one bottle of wine. Because of Trastena’s success and popularity, more and more winemakers are starting to produce raspberry wine in Bulgaria. Though Bulgaria is one of the oldest wine producers in the world, wine tourism is very much in its infancy. That means touring Bulgaria’s wine regions isn’t so easy by yourself (unless you’re fluent in Bulgarian). 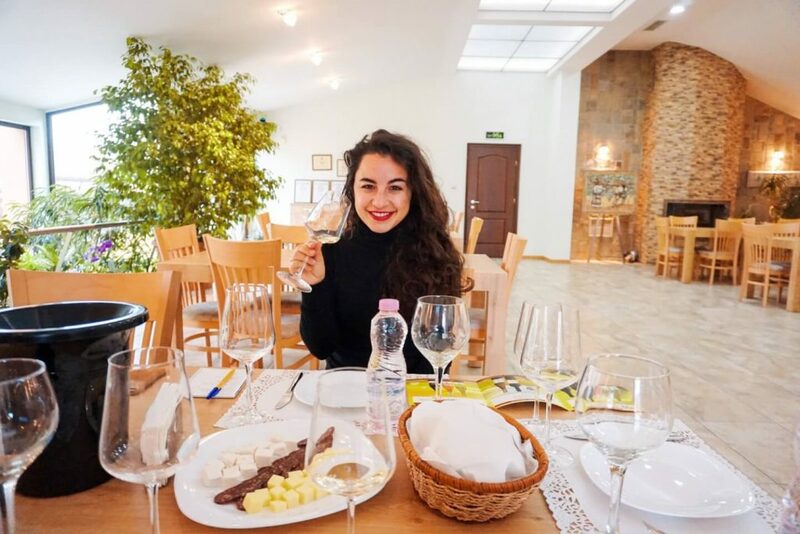 Until Bulgaria’s wine tourism develops, your best bet for accessing Bulgaria’s best wineries and tasting rooms is with a guided tour. We went on a half-day tour with Bulgaria Wine Tours. They offer custom private and group tours from both Sofia and Plovdiv. We highly recommend working with them, because they’re knowledgeable, passionate and very responsive. Our tour with Bulgaria Wine Tours began with a punctual pick-up from our AirBnB in Plovdiv. At the start of the tour, we were given a folder with a tasting notes booklet, a pen, and a map of the wine route in the Plovdiv region. As we drove to our first destination, Co-Founder Vasil filled us in on Bulgaria’s winemaking history and answered all of our preliminary questions. 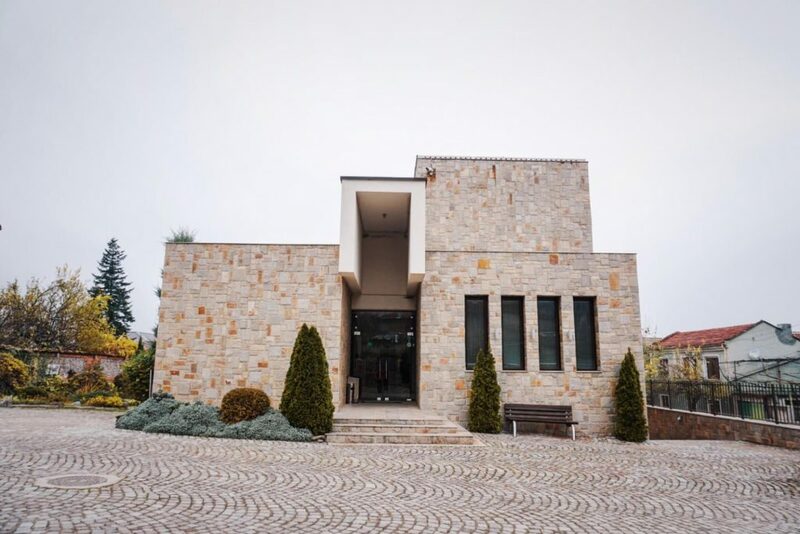 As soon as we arrived at Villa Yustina, a boutique winery in the Thracian Valley, we were warmly greeted and given a tour of the winery premises. This winery has a really interesting backstory. The owner of the winery is a huge manufacturer of stainless steel wine barrels. 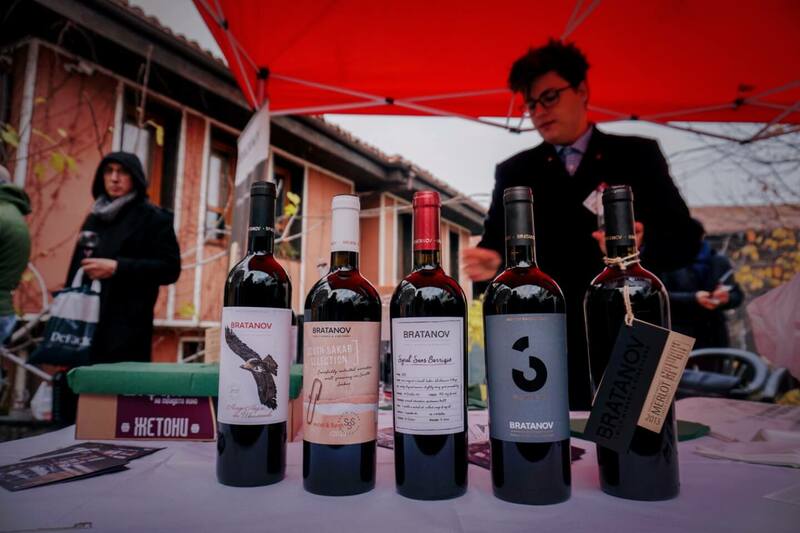 He started making wine as a way to showcase the quality of his product for his showroom. The wine was so good that he established a winery in 2006. After touring the winery, we sat down for an epic wine tasting. Our tasting was paired with delicious cheeses and charcuterie. Each wine was thoughtfully explained to us, and we fell in love with their Monogram Chardonnay (2017) and their Monogram Mavrud & Rubin Magnum Reserve (2013). The Reserve is a Mavrud and Rubin blend, aged in Bulgarian oak for 18 months. After Villa Yustina, we went out to lunch. Vasil patiently explained the menu items and made personal recommendations. 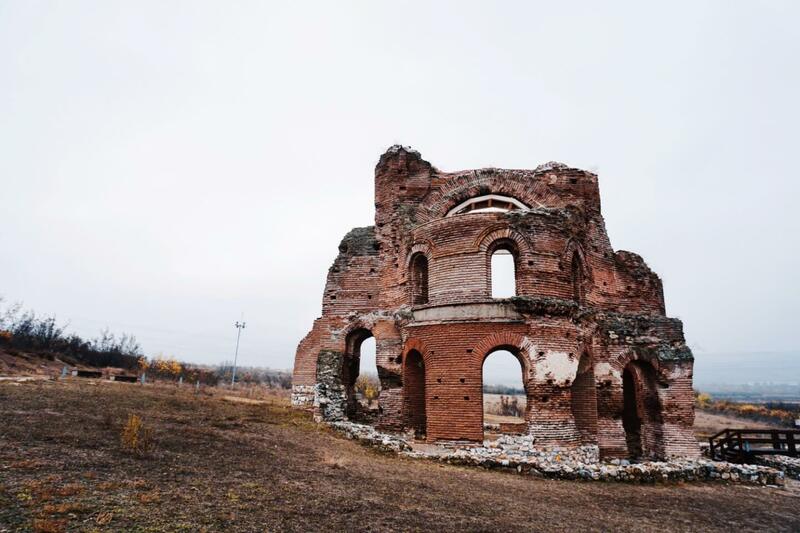 After lunch, we visited the Red Church – an early Christian basilica dating back to the late 5th century AD. Many of the frescoes have been removed for preservation and placed in museums. However, a few faded murals remain. A large baptistry can also be seen next to the church. We had a great experience. 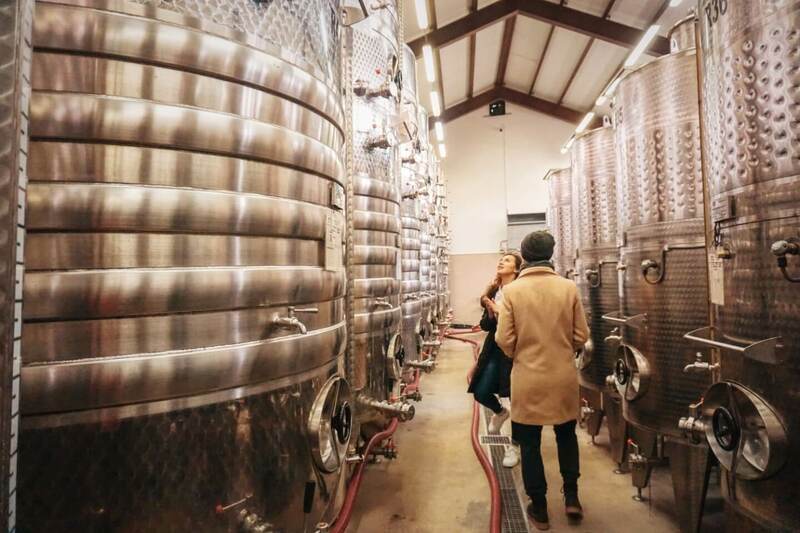 Looking back, we would have opted for a full-day tour and prioritized seeing more wineries. 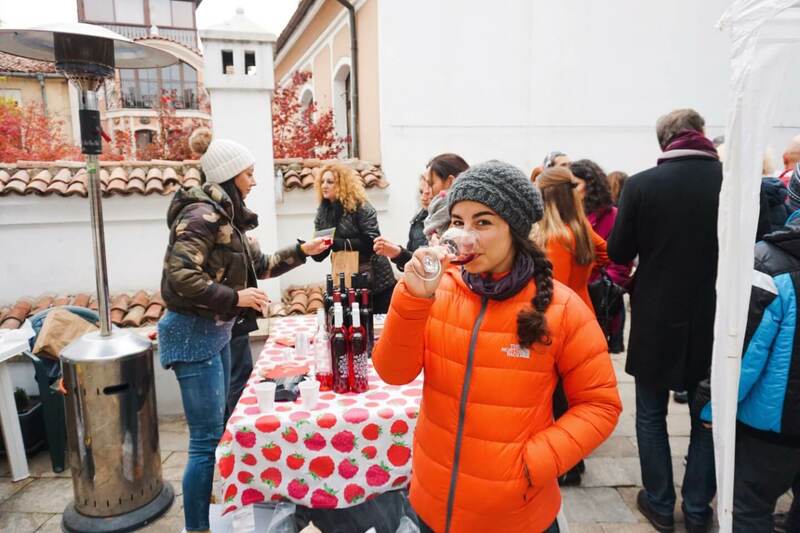 Because we visited Bulgaria in late November, we were able to partake in the Young Wine Festival in Plovdiv. Read more about the Young Wine Festival in our Best Things to Do in Plovdiv post. We were able to sample wine from all over the Thracian Valley and Melnik during the course of two days and partake in the local festivities. There are wine festivals throughout the year, so we recommend reaching out to Bulgaria Wine Tours to find out what makes sense for you. E.g. St. Trifon’s Day (February 14th), Varna Food & Wine Festival, Varna (April), Wine & Gourmet Parade, Plovdiv (May), Rosé Wine Expo, Kazanlak (June), Avgustiada, Stara Zagora (October), Young Wine Festival, Plovdiv (November). To avoid disappointment, make wine tasting reservations at wineries. Unlike other wine regions, spontaneous and casual cellar door visits aren’t the norm. Did you know that Bulgaria is one of the biggest rose-oil producers in the world? Each year in June, there’s a Rose Festival in the Valley of Roses. 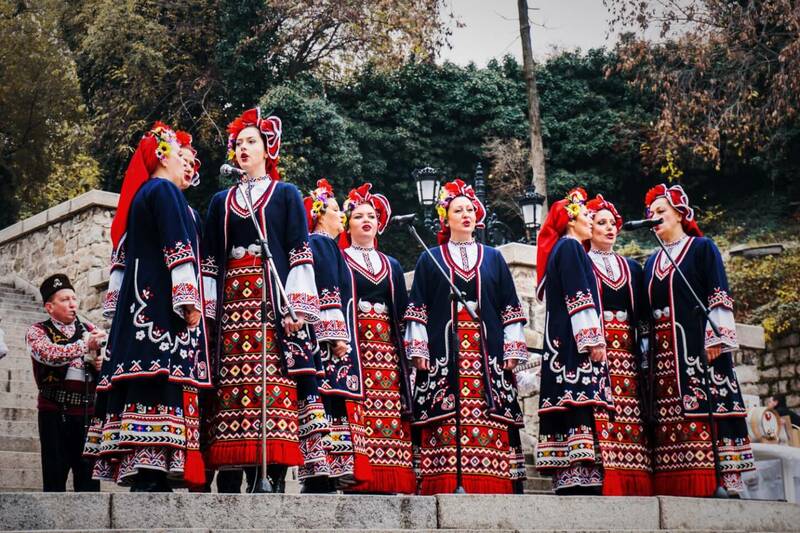 The festival is enlivened with folkloric costume, music, and dance. As part of the celebration, there’s a contest for the best Rosé in the country, and all the producers exhibit their Rosé for tasting. If you want to plan a Rose & Wine themed holiday in Bulgaria, definitely aim between the end of May and end of June, when you can observe the rose fields in full bloom and the rose-picking process. As part of your trip, you could also visit a rose-oil distillery. We were guests of Bulgaria Wine Tours for our half-day wine tour. All opinions are our own. I would have never thought of Bulgaria for wine! Great tips, I definitely want to try some raspberry wine! 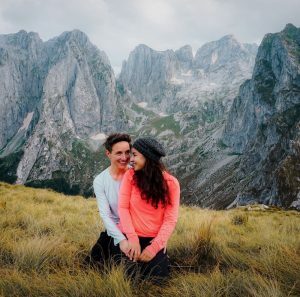 We’re Sabrina and Kati, an Austrian and an American couple, who met in San Francisco, lived together in Germany, and are now roaming the world together. We created this site to help you plan your next trip and to document the best culinary hiking destinations in the world.